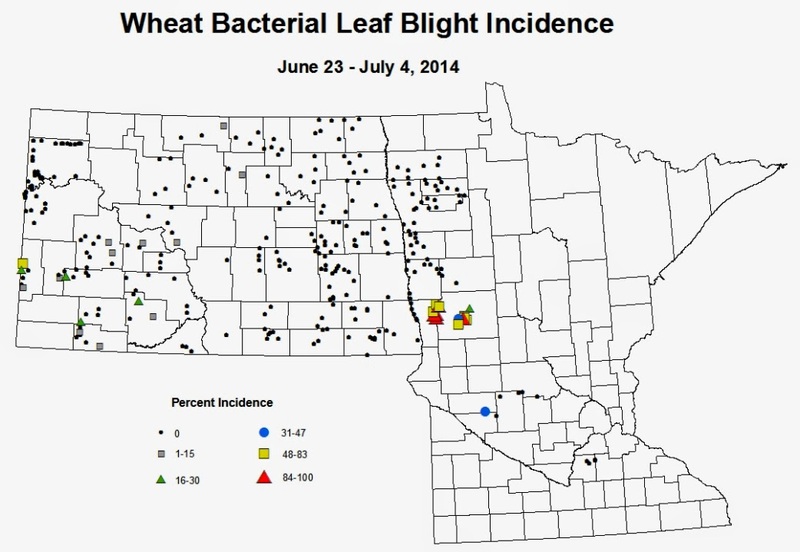 Last week the IPM survey scouts recorded bacterial leaf streak (BLS) in a few wheat fields. Additionally, I noticed BLS showing up in one of my wheat trials on campus. Given these observations, I feel it is important to review information on BLS. 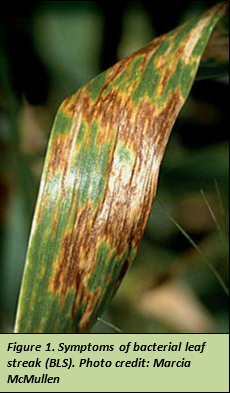 Bacterial leaf streak is caused by the pathogen Xanthomonas translucens pv. undulosa. This bacterium is able to survive between growing seasons on seed and residue. During the season, wind-driven rain and other “splashing” events will spread the bacterium onto susceptible plants. Subsequently, the high wind rain storms experienced in the state may have aided multiple infection events for this pathogen. Early symptoms of BLS are water-soaked streaks on leaf tissue. As the lesions mature, the water-soaked streaks will turn brown and necrotic (See Figure 1). Additionally, leaves with BLS symptoms will appear “shiny” as a result of bacteria drying on the leaf surface (See Figure 2). Given the nature and prevalence of the pathogen in recent years, using less susceptible varieties is the most important long-term management tool. Dr. Zhaohui Liu, NDSU Wheat Plant Pathologist, is screening available wheat varieties in the field for resistance to BLS. Results from these trials will be available prior to next year’s growing season. 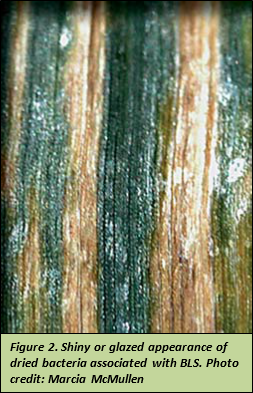 More information on BLS can be found in the NDSU Extension publication Bacterial Leaf Streak and Black Chaff of Wheat.